Yup, that’s a cupcake in a Snuggie. Now you’ve seen it all. I did it, guys. I think I may have crafted the most ridiculous item, ever. The theme for the January edition of IronCupcake:Earth is winter warm up. Now, I’m cold about 85 percent of the time, so I know a thing or three about staying warm. There are external methods (down coat, electric blanket, Wicked Good slippers), and there are internal methods (tea, chili peppers, a good run). I wanted my Winter Warm Up Challenge cupcake to combine external and internal methods. My goal was something conceptual and delicious. I’ll start with the delicious. One of my favorite ways to beat a chill is a nip of an adult beverage. At VHHQ, we like to “fortify” tea before stomping outside to clear the driveway of snow. Fortifying a cupcake with of whiskey is a no-brainer. As for the conceptual… I think it can be said without great argument that Christmas 2009 was the season of the Snuggie, the fleece blanket with sleeves. I have a number of friends who received Snuggies, and my parents’ puppy even got a tiny Snuggie. 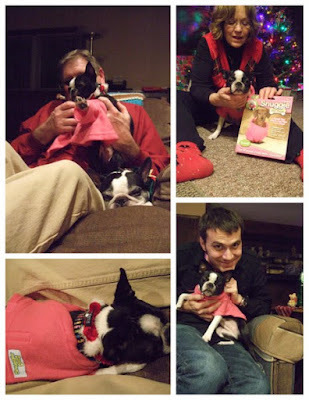 My parents’ Boston terrier puppy, Bella, got a Snuggie for Christmas. Clockwise from top left: My dad puts the Snuggie on Bella. My mom compares Bella to the Snuggie box. MVH cuddles with his puppy-in-law. Bella is overcome with Christmas merriment and opts for rest. With a nod to the zeitgeist, I have created the world’s first cupcake Snuggie for the IronCupcake:Earth Winter Warm Up Challenge. It has sleeves! Cupcakes don’t have arms! It’s high art! It’s low brow! And yes, I’ve included directions for how to make a cupcake Snuggie. You’re welcome. (I’m simultaneously embarrassed and proud.) Stay warm, friends. ALSO: I will let you know when voting starts for IronCupcake:Earth. Stay tuned! Makes six dense, brownie-like cupcakes. Don’t skip the whiskey. The cupcakes are a bit dry without it. Sift together the flour, salt, cocoa powder, and espresso powder. Cream butter and sugar, starting with a low speed and getting gradually faster. Don’t rush creaming; it’s an important step that adds air to the cupcakes. (Check out this treatise on creaming from Baking911.com.) Add eggs, one at a time. Beat in each egg at a low speed or, better yet, by hand. (This keeps the mix from curdling.) Scrape the bowl between each egg. Alternate adding the sifted dry ingredients and the cream, scraping the bowl between each addition. Don’t overmix. Overmixing creates overly dense baked products. Bake for 16 minutes. (I checked after 8 minutes, rotated the pan, and checked again after another 8.) The cupcakes are finished when a toothpick inserted into the center comes out clean. Cool cupcakes for 5 minutes in the tin, then remove them and transfer them to a cooling rack. Once the cupcakes have cooled, poke about 8-10 holes with a toothpick in the top of each cupcake. Some of the holes should reach almost to the bottom of the cupcakes. Sprinkle 1 1/2 teaspoons of whiskey over each cupcake. Do this slowly, about 1/4 teaspoon at a time. The whiskey will run to the edges of the cupcake liner. Allow the whiskey to soak in for at least 4 hours (overnight is better). Frost as close to serving as possible. Top with chopped chocolate chips or anything else you please. Makes about 1 cup. For the best whipped cream, put the bowl and beater(s) in the freezer at least an hour before you make the frosting. Put the cream and vanilla into a chilled bowl. Sift the sugar and cocoa together twice and add them to the cream and vanilla. Whip the cream into soft peaks. (It must be soft enough to spread.) If the cream gets too warm and starts to soften while you’re frosting, put it in the fridge for a few minutes and rewhip it into soft peaks. Aww, it looks like Cupcake Snuggie wants to give you a hug! This Snuggie fits a standard-size cupcake: about 1 3/8 inches tall and 2 3/4 inches in diameter at the top. Glue the short ends of the torso piece together, overlapping 1 inch. Glue the short ends of one of the sleeves together, overlapping about 1/4 inch. Repeat for the other sleeve. Let the glue dry before rolling the collar (about 1 inch) and the cuffs of the sleeves (about 3/4 inch). Cut three tiny slits (about 1/4 inch) equidistant from each other in the uncuffed end of each sleeve. (Don’t cut into the overlapped area.) You have made three tabs. Press the tabs out. Working one sleeve at a time, dab glue on the inside of each tab. Stick the sleeve to the torso, placing one tab under the folded collar of the torso (you will probably need to roll up the collar a bit for placement). Press the other two tabs to the torso. Repeat for the other sleeve. Drop the UNFROSTED cupcake into the Snuggie from the top. Frost your cupcake, being careful to not soil the Snuggie. (Drape the collar in plastic wrap to keep it clean.) Give the cupcake to a friend who looks cold and likes to giggle. So cute! Everyone (and thing) needs a Snuggie! So making these. One of my favorite local ice cream joints makes a Jameson ice cream with chocolate cookies in it. Honestly the most delicious ice cream on the planet. This might be it in cupcake form. The Snuggie is genius. Well done.